Every time I visit the supermarket I take a look at the gluten-free cookies in the health market area. I eat healthy on a regular basis, but I do enjoy cookies and other baked goods on occasion. These chocolate and walnut biscotti from Pamela’s Products were delicious and inspired me to make chocolate and walnut gluten-free waffles the next weekend morning. 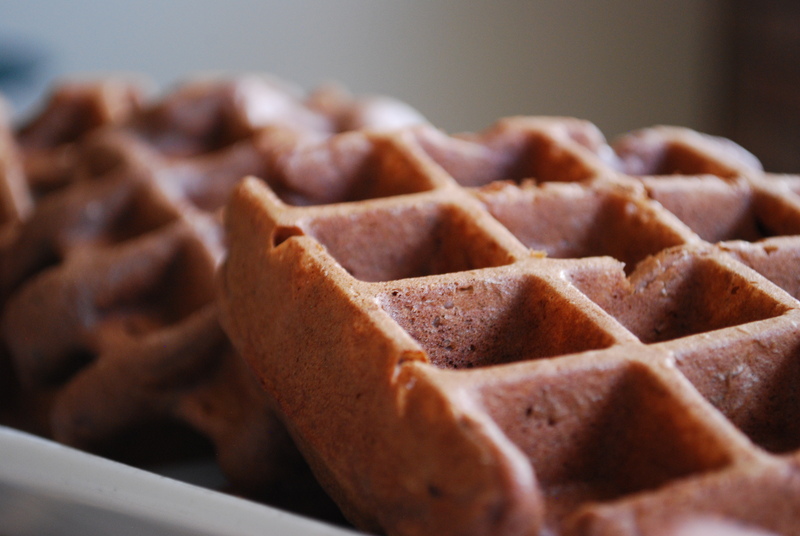 I am sure there is a better way to do this, but on a Sunday morning when I am making this fun breakfast for us adults, as well as a healthier one for the baby, the best way to make these is by mixing all ingredients and throw the batter into a hot waffle iron. When it beeps they are ready. * Make sure you pour maple syrup over these, the unsweetened cocoa makes these on the slightly bitter side, but the syrup sweetens them to just the right level. You could substitute the eggs for 2 cups of apple sauce for a sweeter, and vegan, version.